Linda Hopkinson sent along the picture. Thanks Linda!! And Richard Skovran, Ambassador for Myrtle Beach tells us that the group at Crabtree Memorial Gym hold fun round robin events several times during the year. These are some of the players that compted on August 12th! 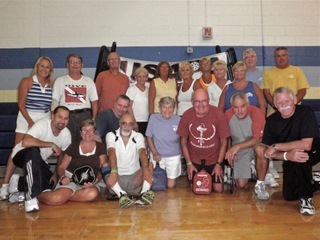 Richard also reports that the kids are back in school so pickleball has resumed at full force at Myrtle Beach's Pepper Geddings Recreation Center.